IMPERIAL GROUND CREW ...with jetpack? Commentary: Here's one you'll like. 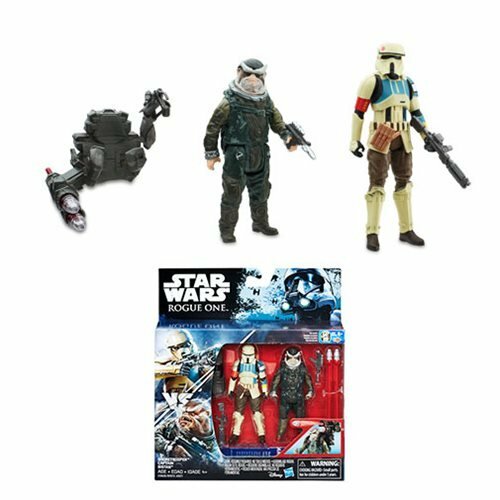 The Imperial Ground Crew figure looks like it should fit in with the rest of your stuff. 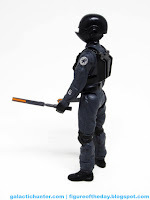 It has a big silly flight pack and two safety batons, plus a look that looks like it could have been in the original Star Wars 39 years ago if the movie had more of a budget - it was a cheap movie when compared to Alien and The Empire Strikes Back. 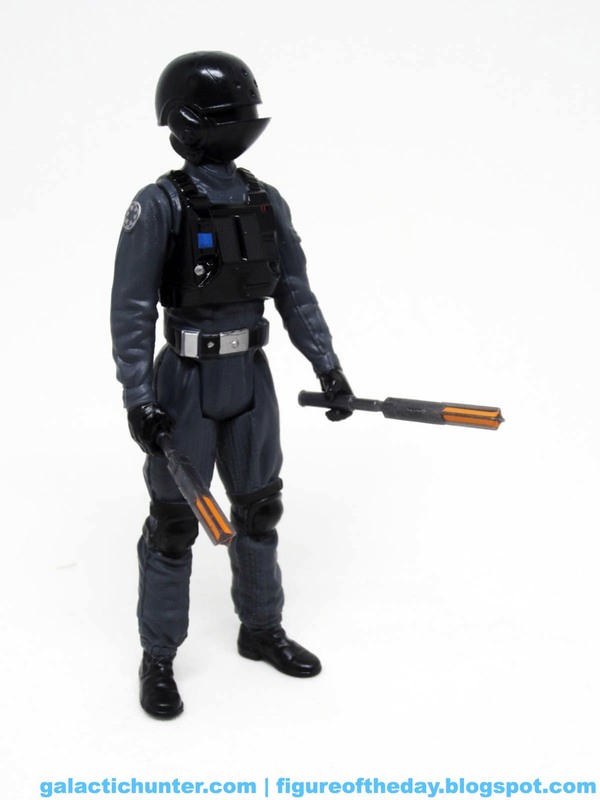 As such, a lot of costume bits were reused and there weren't a heck of a lot of different helmets and uniforms, probably mostly because nobody was sitting around going "if we do like 3 more trooper costumes we'll sell a ton more toys" at that point. At first glance, I thought I may have seen this somewhere before. Its inspiration is fairly obvious, but the helmet and uniform are different - it lacks the long, sweeping build and has tightened the design up more than a bit. The deco is similar, but adds kneepads, a more ornate chest piece, and more on top of a sharp sculpt. The folds and wrinkles are ood, and "V" on the back of his body looks like it might connect to something - but what? It's not the jet pack. It's a nifty design that seems to suggest significance where there perhaps is none, much like the "OII" of old. But having not seen the movie, I don't know nothin'. 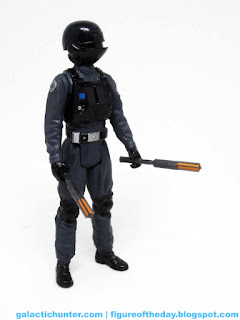 His main accessories are a pair of painted lighted batons, much like what you use if you're on the tarmac and are trying to signal planes. 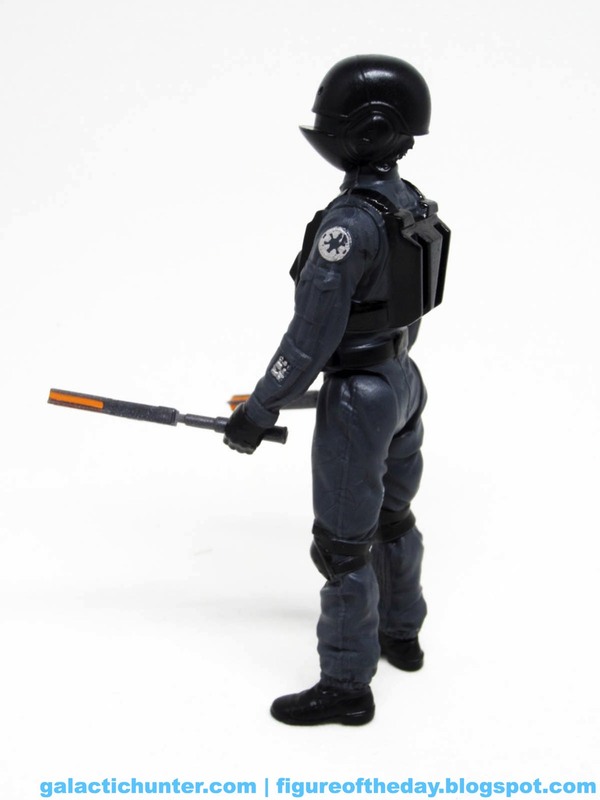 An Imperial figure of any kind without a gun or a lightsaber is a real rarity, and it takes massive guts to put out a trooper-like figure without a weapon. Oh, and he's short - like Rey short, but I don't know how widespread this is yet. Jyn seems tall compared to Cassian, so maybe this is just a rescaling in order to make the upcoming Darth Vader figure look larger. We shall see. Alls I know is that I've got other Stormtroopers that tower over this guy. 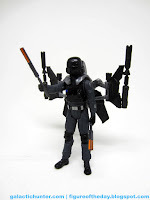 The jetpack ain't bad - I daresay of the big accessories we've seen since the Disney era began, this may be the best. (But I'm still opening figures, you're reading these reviews as I open each one.) 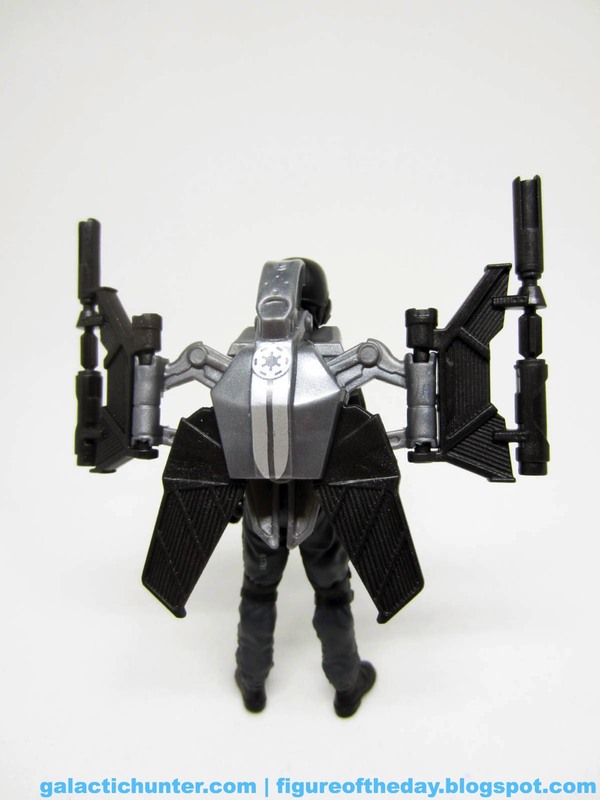 It folds open with swing-out cannons, and wings fold out nicely as they're geared together. It comes unadorned save for a silver stripe and Imperial logo painted on, but it looks like it's something that you may have had with a 1980s or 1990s Kenner toy from Batman or another line. It fits nicely, he can still stand while wearing it, and it's meatier than anything else Hasbro has given us on a basic figure in some time. So far? Best in show. 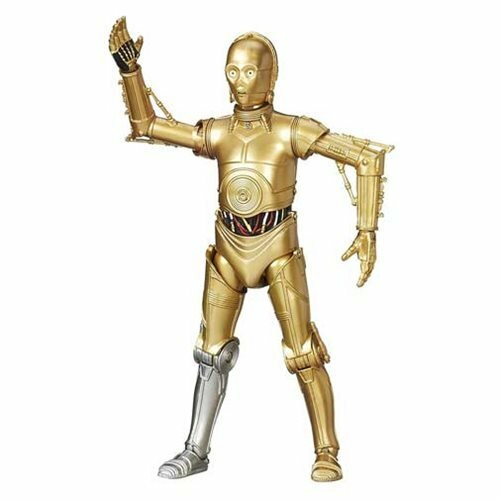 It's new, it looks like it could fit in with virtually any era of Star Wars Empire action figures, and the costume is on the happy side of decent. It might not be astonishingly different or truly out of this world in how it looks, but the glossy armor and soft grey work nicely together. I suspect that despite being packed out at 2 per case, it'll sell out quickly if not firstly. They could've done a two-pack of the figure, for the amount of materials the stupid pack wastes. Is this Star Wars, or a mech from Battle of the Planets? 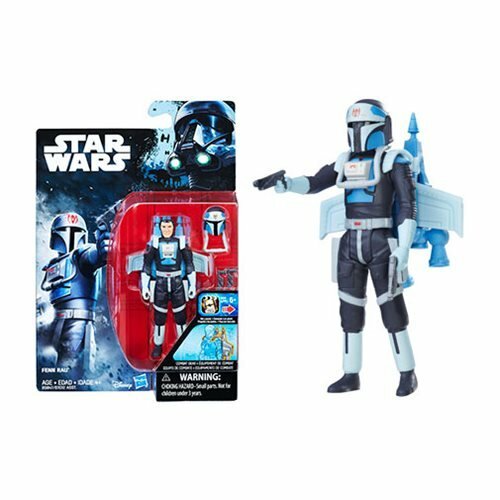 I wonder if the short height was so they can re-release the body with a Jyn head (as seen in the teaser), or at least allow fans to make one at home.